Its rich history and famous murals are just few of the things that attract people to this church especially during Holy Week. During the Lenten Season, many Catholic devotees profess their faith by doing religious activities such as Visita Iglesia. It is a Catholic faith practice where people visit at least 7 different churches to pray the Stations of the Cross and is usually done on Maundy Thursday or Good Friday. In Metro Manila, Sto.Domingo Church is one of the churches that is most visited by the faithful. It is where the image of Our Lady of the Rosary of La Naval, the patroness of Quezon City, can be found. During Holy Week, more and more people want to pay a visit to the church to pray to the "miraculous image of Our Lady of the most Holy Rosary." Formerly located in Intramuros, Manila, this Dominican-run parish church was rebuilt six times due to multiple destructions caused by various events. The first Sto.Domingo church was built in 1588 using frail materials like nipa and cogon that's why it was easily wiped out by a fire incident. The succeeding churches were also destroyed by earthquakes and massive attacks during the Second World War. However, the Dominican priests stood still to rebuild the church after every disaster, as they wanted it to symbolize the strengthening of the Catholic faith in the Philippines. When the war finally ended in late 1940s, they found the intact image of Our Lady of La Naval. 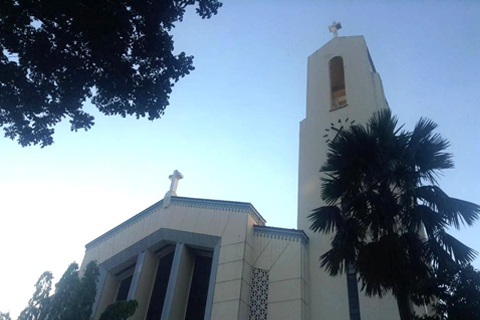 From there, they transferred it to a safe place and rebuilt the sixth and present Sto.Domingo church in 1957 in Quezon Avenue, Quezon City. In 2012, the National Museum declared Sto. Domingo church as a National Cultural Treasure because of it "being an institution and a structure, as well as a repository of modern art." Its Gothic and Romanesque architecture was designed by Jose Ma.Zaragoza, who was then a student of the University of Sto.Tomas. Aside from its rich architectural form, the church also houses other treasures. Included are the murals made by National Artists Carlos 'Botong' Francisco and Fernando Amorsolo. One of the famous paintings by Amorsolo entitled the "Burning of Sto.Domingo," which depicts a fire incident that destroyed the church, was enshrined in the edifice, serving as an added attraction for church goers. Sources: Inquirer.net and the National Museum.